:"Not enough" is the theme of our day. Fear, scarcity, and inequality dominate the media cycle and are constant companions in our culture. While 74 percent of Americans believe in God, we can feel our world changing in ways that simply seem out of control. We want to cling to a sovereign and loving God who tells us repeatedly in Scripture to "fear not," yet it is estimated that nearly 90 percent of his followers have a scarcity mentality rooted in fear. Five times in Scripture, Jesus showed us a pattern to deal with fear and how to access his abundant provision, both spiritually and practically. In The God Guarantee, Jack Alexander uncovers the four steps in this pattern, showing readers how to live it out in order to experience true abundance. Far from a prosperity gospel, this book is not about how to get rich quick, how to manage your money, or how to give it all away. Instead, it will change the reader's conversations about finances completely and, as a result, will transform the way they see and access God's provision in every single area of their lives. 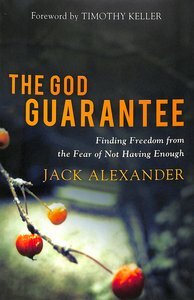 About "The God Guarantee: Finding Freedom From the Fear of Not Having Enough"
Jack Alexander has built and led companies in real estate, business services, and technology. Two companies that he cofounded made the Inc. 500 list, and another, in which he is a partner, made the Inc. 5000 list. He is currently chairman and cofounder of a software firm called Understory, as well as for The Reimagine Group, a content company that makes high-quality media for the church market. A previous recipient of the Ernst & Young National Entrepreneur of the Year award, Alexander is also winner of six global awards in the corporate travel and hospitality arena. In 2005, he received the Family Honors Award as a businessman who made a positive impact on the American family. He is a regular speaker, coach, and board member for a number of businesses, nonprofits, and ministries. Jack lives in Atlanta, Georgia, with his wife, Lisa. They have three grown sons and three grandsons.